Despite the House passing the operating budget over to the Senate about three weeks later than planned after getting bogged down in lengthy debates over the size of this year’s Permanent Fund dividends, legislative leaders are now again talking about wrapping the session up soon — likely totaling just a little more than 90 days in Juneau this year. That’s because Senate Republicans appear to have generally conceded to the Democrat-led House Majority coalition on the size of this year’s operating budget. The budget numbers coming out of the Senate Finance Committee are in line with the budget plans from the House and Gov. Bill Walker that mostly call for flat funding of about $4.5 billion of unrestricted state general funds in the fiscal year 2019 budget. “There has been some high-level cooperation to get us to this point on the budget,” Republican Senate President Pete Kelly said during an April 9 press briefing. The apparent agreement to flat-fund the operating budget is somewhat of a surprise given it comes just a few weeks after the Senate passed a Finance Committee-sponsored $4.1 billion UGF spending cap. “The big, heavy stuff, I think, is out of the way,” Democrat House Majority Leader Chris Tuck said April 10. In exchange, the House Majority appears to be backing off on its push for a broad-based tax or oil tax increases to further close the budget deficit this year. The House Resource and Finance Committee’s have proposed oil tax increases to keep that option on the table for an end-of-session compromise package, but major changes to the production tax structure appear unlikely. Tuck also acknowledged — in spite of his coalition’s prior resistance — the Legislature is headed towards a “POMV only” deficit-reduction plan this year. There is also agreement to institute a 5.25 percent of market value, or POMV, draw from the Permanent Fund currently valued at about $64 billion. And with similar consensus around a $1,600 dividend, the state could be left with a deficit in the $500 million range in 2019 after the POMV draw is split between funding the dividend and government services. It remains unclear whether the Legislature will order the POMV draw via language in the operating budget — a method Alaska Permanent Fund Corp. leaders have cautioned against for the year-to-year instability it could insert in managing the Fund — or a longer-term separate piece of legislation. Both the House and the Senate passed a POMV mechanism last year in Senate Bill 26, but differences over contingencies to correspondingly implement a tax or spending cap have kept the bill from being sent to Gov. Bill Walker, the original proponent of SB 26. Senate leaders have insisted on passing SB 26 or similar POMV legislation but they are not committing to holding out for such a bill. Tuck and others in the House Majority have downplayed the necessity for putting a Permanent Fund POMV draw in statute long-term. He noted the Legislature has gotten into the habit of ignoring its own statutes lately, particularly when it comes to paying dividends, and there is no assurance it would stick to POMV legislation any tighter. The Senate Finance Committee has also proposed a 5.25 POMV draw for the current 2018 fiscal year to backfill the CBR to $4.2 billion, which would give the state more financial breathing room for cash flow management and in the case of a large emergency, according to Hoffman and fellow Finance co-chair Sen. Anna MacKinnon. If the operating budget passes out of the Senate more or less as it is in the Finance Committee there will undoubtedly be spirited debate in the budget conference committee over oil tax credit payments and Medicaid funding, which are two of the larger differences in the House and Senate budget plans. The House — based on a different interpretation of the tax credit payment formula — appropriated $49 million for tax credits, while the Senate is proposing $184 million, which is in line with the administration’s calculation. The tax credit payments could also be resolved if the governor’s proposal to bond for roughly $800 million to pay the credits off entirely is passed. The tax credit bonding legislation has moved slowly in both bodies but with general agreement that it’s at a minimum not a bad idea, the possibility remains that it could move quickly in the remaining days of the session. Under the bonding plan companies would accept a discount rate of up to 10 percent on the credits they are owed to get the money up front, which would shift the state’s borrowing costs to the credit holders and prevent the state from spending more on the politically sensitive oil tax credit program. The Senate also cut roughly $70 million from Medicaid funding — a move similar to what the Legislature did last year — which led to a large supplemental budget to cover those expenses afterwards. 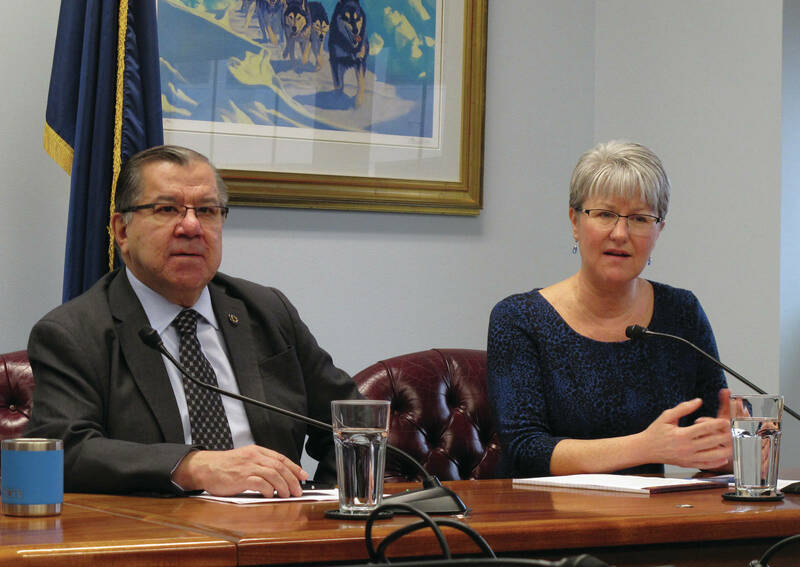 House Health and Social Services Committee chair Rep. Ivy Spohnholz, D-Anchorage, criticized the Medicaid cut, noting it does not change the state’s obligation and would just lead to another large supplemental budget next year. “Given that the requirements for Medicaid are defined by law it doesn’t seem worth going to battle over when we’re going to pay for it whether it’s included in this budget or the supplemental, we’re going to pay for it,” Spohnholz said.